Mar. 12, 2015 8:00 p.m. The Wetaskiwin Society for the Promotion of the English Language and Literacy (SPELL), the governing body for the Wetaskiwin Community Literacy Program, held its Annual General Meeting on February 26th. As well as continuing to provide one-on-one tutoring by volunteers for those wanting to improve their basic literacy or for seniors wanting to learn computer skills, and tutoring or classes for English Language Learners, the Literacy Program has increased its class options to include preparation for the IELTS test, English Fluency classes, and on work site ESL classes. As needs become apparent, new programs are added, such as a class to prepare for the written test required to get a driver’s license. The Literacy Program also continues to offer Family Literacy programs, including Rhyming Tots for caregivers and preschool children, in partnership with the Early Education and Family Wellness Centre and Parent Link, two locations each week. Its Outreach Program visits Dayhomes and the Boys & Girls Club Daycare, as well as supplying Books for Babies to every new baby through the Health Unit. The Wetaskiwin Community Literacy Program very much appreciates all those in the community who have given it considerable support which has contributed to its ability to expand its programs. As the government mandate moves this fall toward expecting that those who can pay should pay, this community support will be even more essential in making certain that free programs can continue to be given to those who truly need them. The Wetaskiwin Community Literacy Program extends a big THANK YOU to all who have supported the program as volunteers or financially. 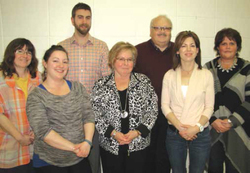 Pictured: Directors and Staff of the Wetaskiwin Community Literacy Program, left to right, Family Literacy Coordinator Wendy Graham, Adult Literacy Coordinator Niki Tune, Treasurer Steve Latimer, Member at Large Charleen Schnick, Chair John Maude, Member at Large Naomi Flug-Beaudoin, and Executive Director Charleen Thiessen. Vice-Chair Brenda Doupe was unable to attend. Photo by Margaret Chegwin.